Our State of Generosity focuses on the projects, systems, and relationships that foster philanthropy in all of its forms. Transmitting and strengthening this tradition in future generations is a goal involving decades of work and investment. Surabhi embodies the success of these efforts. 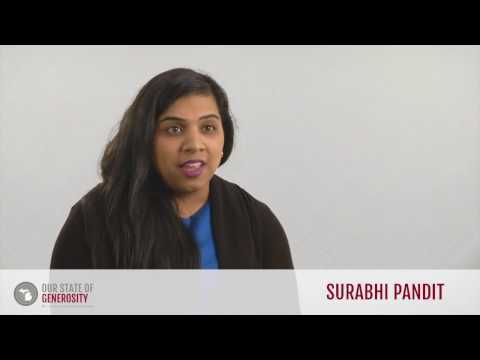 Exposed to formal philanthropy at a young age, provided opportunities to learn and grow, empowered with money and access to lead at the local and state level, and offered an academic and career path, Surabhi speaks for the next generation of Michigan’s philanthropic leaders. Ms. Surabhi Pandit talks about her career in philanthropy. Ms. Surabhi Pandit talks about her experience as a Youth Advisory Committee (YAC) member and the flexibility she had working with local government. Ms. Surabhi Pandit talks about creating a teen center and organizing a youth diversity symposium through her time as a Youth Advisory Committee (YAC) member. Ms. Surabhi Pandit talks about the participation and communication between young people and adults in Youth Advisory Committees (YACs). Ms. Surabhi Pandit talks about how her Youth Advisory Committee (YAC) experience taught her that a good leader leaves behind a framework so their efforts and vision can continue. 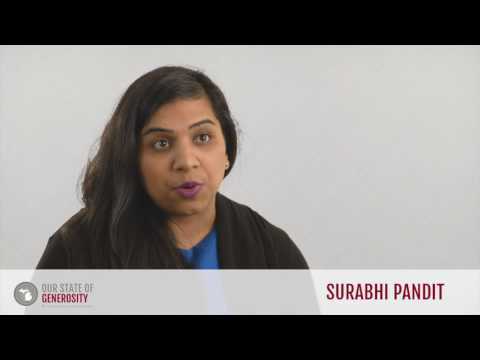 Ms. Surabhi Pandit talks about the collaboration between Michigan's four infrastructure organizations, non-profits, community foundations, and beyond. Ms. Surabhi Pandit talks about how Michigan is nationally known for its strong, philanthropic infrastructure. Ms. Surabhi Pandit talks about how people from all walks of life donate, and every contribution is appreciated. Ms. Surabhi Pandit talks about her friendship with Rob Collier and the value of mentoring in philanthropy. Ms. Surabhi Pandit talks about the characteristics a Youth Advisory Committee (YAC) must have in order to be successful. Ms. Surabhi Pandit talks about how philanthropy and government can learn from one another. 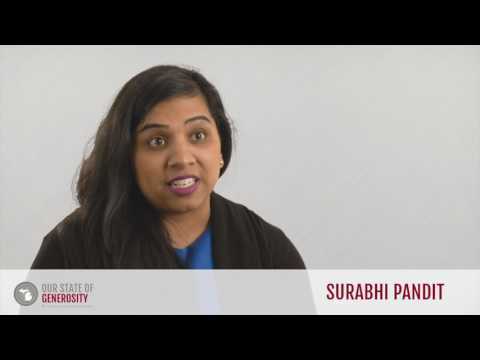 In 2010, Surabhi Pandit earned a Bachelor’s degree in Sociology and South Asian Studies from the University of Michigan. She went on to receive a Master of Social Work degree in Social Policy & Evaluation, and Community and Social Systems in 2011. Ms. Pandit’s philanthropic journey began at the Southfield Community Foundation during her eighth grade school year. She attended meetings with her sister, a member of the Youth Advisory Committee (YAC) at the foundation. Eventually she became directly involved herself throughout high school. After high school, Ms. Pandit became a member of the statewide YAC under the Council of Michigan Foundations (CMF), the Michigan Community Foundations’ Youth Project (MCFYP). When she was 16 she served as a trustee on the board of the Southfield Community Foundation. While on the statewide YAC leadership board, she not only demonstrated her dedication to philanthropy through volunteer service, but also gained experience in grantmaking. She later interned for CMF, and eventually became a public policy fellow which exposed her to foundations across Michigan, and ultimately led to her involvement at the Community Foundation for Southeast Michigan. While serving on the YAC in Southfield, Ms. Pandit and the other council members noticed the community’s desire for a teen center. Being down the street from the mayor, city administrator, and community foundation, she worked relentlessly to see that the community eventually got the teen center it wanted. This experience developed relationships and helped Ms. Pandit become comfortable approaching the city’s administration on a regular basis. Her networking skills were fundamental to the rest of her time with YAC, and essential to completing later projects. Also while serving on the YAC in Southfield, Ms. Pandit helped organize an annual youth diversity symposium. She recalls one of the greatest accomplishments of her YAC experience, when one year they brought together about seven-hundred youth from all over Michigan to participate in a day-long discussion on diversity, from local issues to Supreme Court cases. The symposium was a fundamental event in involving youth in philanthropy and social justice all over Michigan. It began conversations on diversity and inclusion in philanthropy and in local communities, and provided experience to young people in organizing events and discussions. Though adult advisors oversaw the symposium, the youth of Michigan facilitated and organized all of the events and discussions, which provided invaluable practice for careers in philanthropy. In 2014, Surabhi Pandit became a program officer at the Community Foundation for Southeast Michigan. In 2015 she spearheaded Catapult, a program dedicated to community engagement through providing funding for entrepreneurs in the community. This program has impacted a variety of local communities, from writers to chess club participants. Catapult is an ongoing annual project that will continue to provide local communities with the resources they need to thrive, both with funding and training (1). 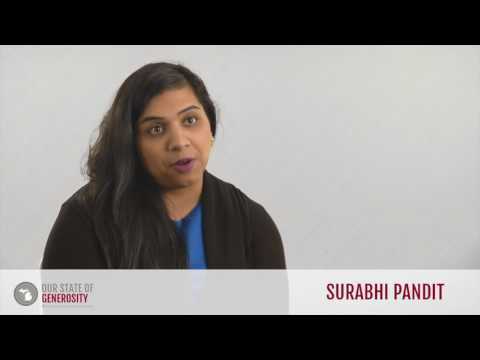 Surabhi Pandit was interviewed regarding her insights and experiences working with Michigan’s philanthropic community and the Our State of Generosity (OSoG) partners. The following are selected quotations from her interview specifically related to the five organizing themes of the OSoG project.